"The event that shaped our world." Epic. Warner Bros has unveiled a full theatrical trailer for Christopher Nolan's WWII action thriller Dunkirk, about the Dunkirk evacuation in 1940. This trailer is also playing in front of Rogue One, with the prologue in IMAX theaters. Starring Mark Rylance, Tom Hardy, Cillian Murphy, Kenneth Branagh, James D'Arcy, Harry Styles, Aneurin Barnard, Jack Lowden, and Adam Long. When Allied soldiers from Belgium, Britain and France were surrounded by the German army during a fierce battle in France at the start of WWII, they had to evacuate by boat across the English channel. Finally we get some real footage and holy hell does this film look incredible (but of course it does). You can still see the first short teaser trailer for Nolan's Dunkirk here, for a different look at this WWII film. Dunkirk tells the story of the miraculous evacuation of Allied soldiers from Belgium, Britain and France, who were cut off and surrounded by the German army from the beaches and harbor of Dunkirk, France, between May 27th and June 4th, 1940, during Battle of France in Word War II. 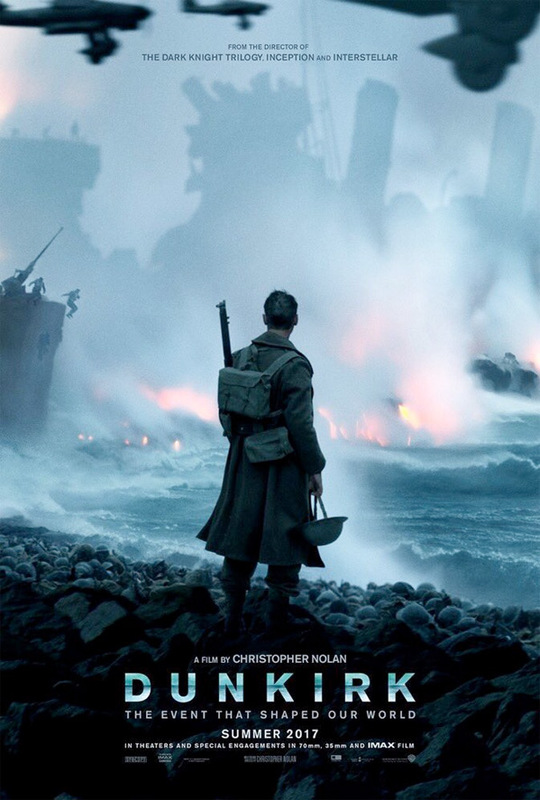 Dunkirk is both written and directed by acclaimed British filmmaker Christopher Nolan, of the movies Following, Memento, Insomnia, The Prestige, Inception, The Dark Knight Trilogy and Interstellar previously. It was filmed on location on the actual beaches where the evacuation took place in Dunkirk, France. Warner Bros will release Nolan's Dunkirk in theaters everywhere starting July 21st, 2017 next summer. How does this look so far? Nolan has never disappointed me. Inception disappointed the hell out of me. But the rest of his films have either impressed me or blown me away. I feel the same way about INTERSTELLAR. I thought it was a goofy film. I can't say I was necessarily disappointed by Interstellar, but its been my least favorite of his films (that said, I still loved it more than 90% of other Hollywood's movies). I feel Interstellar could of been way better without Matthew and Ann Hathaway. Matthew's acting doesn't impress me, also, it just seemed as though any of his acting and emotions fit the scripting. And Ann Hathaway just seemed to laugh at everything. Hathaway is a good actress, but her big eyes and huge mouth scares the hell out of me. Matthew McConaughey ? You should be joking. He's tremendously gifted. Inception?!?! Wow, that's a first for me. I think Inception is tremendous, but to each their own I guess. This might be exactly the movie America needs right now. Looking forward to this. Nolan and WW2 is a good mix. It's still a mystery why the Germans didn't annihilate the Allies on the beach. They had the chance. And finally a war movie where it's not all 'USA USA! And Hoo-Rah! Because the Allies had Hellboy on their side. You should have known this. Before I gripe, let it be known I'm a HUGE Nolan fan. Memento, The Prestige, The Dark Knight, Inception and Interstellar are all top films for me, however, this trailer felt a bit underwhelming. Maybe it's because I'm not familiar with the story of Dunkirk? Or maybe because it's a bunch of random footage (which looks beautiful btw) thrown at you? I guess I was hoping for more "adagio" like the teaser, and instead it was more "allegro"? It didn't feel like a proper representation of a Nolan film. Disjointed and haphazard his films are definitely NOT. Regardless, I'll still be seeing it. Rant end. Probably a trailer edited by a drunk intern. ;D Like you said, the Dude knows his job, so we shouldn't be disappointed. That was exactly my thought. "Here kid, try your hand at this. If you're good, we'll keep you on. If it's sh*t, well...there's the door." And as this kid is thick, he will reply: " should I integrate it in the opening scene ? " Nicely written, well said. I'm sure we'll get more of an idea of the story soon. Allegro instead of Adagio? Damn son!!! Maybe the most high brow comment on FS, ever!! I had to look those terms up. So did I. Those piano lessons I took were a LONG time ago. HA! You underestimate yourselves! Bo has thrown some high brow stuff out more often than I can muster. I believe there is a statue of him at the camp of the SAS, very much respected as one of the originals. I guess I am a bit of a history Buff, and the first 20 minutes of Saving Private Ryan is right up there in presenting the visceral side of war. That's what this felt like. Nolan has a knack of making the fantastic, look and feel real. Batman was never so grounded in the real world until Nolan gave it his treatment. Nolan made Interstellar flight real. Dunkirk was a real event, and I have no doubt that Nolan will make us feel a part of that. https://en.m.wikipedia.org/wiki/Dunkirk_evacuation Please read. Calling these people cowards is awe-inspiring in its ignorance. That is literally the dumbest comeback ever. You're still the moron who couldn't finish Blade Runner and thinks the allies were cowards during WWII. Are you a nazi? Anti-Semite? you don't know your mom's address, coward? So no one is going to be honest and admit that the trailer looks underwhelming?? I could understand your point of view until I read the second last word. Calling them cowards turned you into a clueless idiot. Side comment - the heroes are the people getting them home. England sent everything that could float over the channel. I get what you are saying, it's kind of like a car racing movie that doesn't race cars a la FAST AND THE FURIOUS series. But in this case, they knew they lost the battle and did not want to die for "glory". I don't really have a problem with that. Maybe if they just dropped their arms and fled, but the Germans retreated for no particular reason and they saw an opening and took it. This film is based on an actual event which helped to shape the rest of the war. Many of those "cowards" made it to safety and then returned to fight and beat the Germans. Your comment is disrespectful to every single man and woman that fought that war. Dude is right, you are a clueless idiot !! So your definition of a coward is someone fleeing no matter the reason? That puts you in a somewhat better light. You are still clueless but at least you can fix that by using a dictionary instead of needing to go to the doctor because there's something wrong with your head. This is old news - but just on the principle: I don't care whether you want to watch the film nor do I care about changing your mind. I'm not the taste police. What I do care about is you disrespecting people who were in a desperate situation. They escape you brain fart. Jack Churchill Vampire slayer. I buy it. Completely unimpressed by this trailer. Meh. Amazing cinematography and an incredible piece of history aren't for everyone. Have you watched the new Transformers trailer? Might be more your speed. Snore. Snore snore snore snore. 2 years ago he posted this... "Holy crap...this was awesome.... getting to understand the amount of work....teamwork.... and creativity.... that is involved. The Transformers movies are truly epic events. Thank you Michael Bay and to everybody involved." THIS GUY LOVES TRANSFORMERS MOVIES!!!! cowards fleeing you are literally one of the dumbest human beings I've ever come across. Whenever I see that photo of British and French troops wading through water to board an evacuation ship at Dunkirk, I think of one them hollering out, "Hurry lads, let the Yanks do the heavy lifting!". Reading the comments from Subjects of an unelected Hereditary Crown, you'd swore the Brits hadn't read their history. Churchill said it best, "...we must be very careful not to assign to this deliverance the attributes of a victory. Wars are not won by evacuations." The Yanks storming Normandy showed you how its done.